If a San Francisco motorist on the road at night sees a white-clad motorcyclist draw alongside and hold up his hand, it does not mean that he is to be handed a summons. The motorcyclist is a headlight repair man. Four of them, distinguished from policemen by their unusual costumes, are now patrolling the city’s streets looking for cars with one or more lights out. When one of these riders spies a prospective customer, he stops him and offers to replace the defective headlight at a nominal fee. Usually the driver accepts as this is cheaper than continuing and getting a summons. Not a knucklehead; the knuck was introduced in ’36. It looks to me like a Harley flathead . . . . 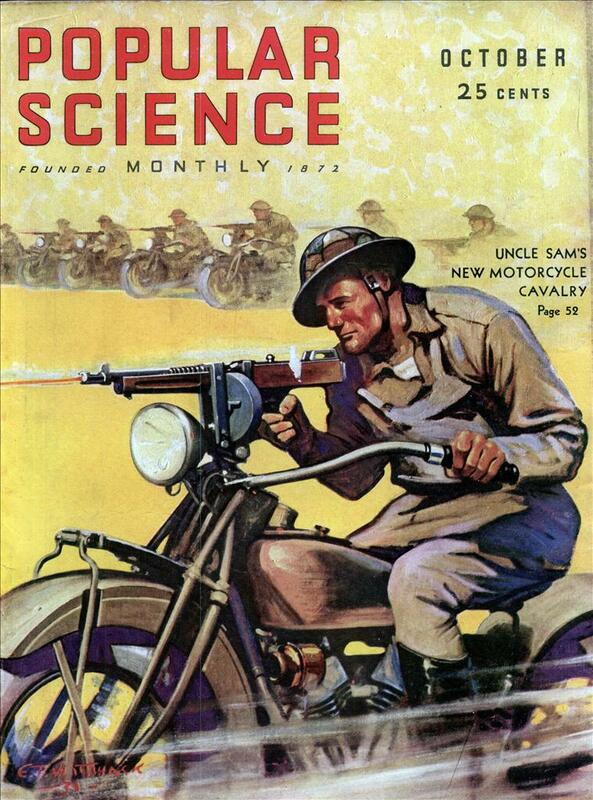 Which bike is the one on the cover with the Thompson mount? Radebaughâ€™s virtuosic airbrush technique created luminous illustrations which conveyed the sleek, streamlined look of the future. From flying cars to glamorous skyscrapers, his renderings were both pragmatic and fantastical, showing possibilities unimagined, derived from the technology of the day. Radebaugh: The Future We Were Promised is a career-spanning overview of the recently rediscovered artist’s illustrations, cartoons and biography. Here is input from my brother John on the type of bike in the Repairman Photo. John is considered about the end-all Harley and Indian guru out of southern Oregon. Got his fist Indian Chief, a 41 model, back in about 1967, followed by a string of Chiefs & Scouts, including a 1934 with the Ace 4-cyl., and a zillion other bikes along the way. Here ya are!